Summer in the Philippines is probably one of the worst in the world. We sometimes get a 39 C temperature for the months of April and May. One of the best ways to cool down without having to go to the beach is eating summer Filipino food. As a tropical country, there are probably more summer Filipino food here than there is in countries with four seasons. With the onset of the global warming during the last decade, the summer heat has been more horrible than it was before. Since we cannot always go to a pool party (it’s a waste of water too), we try to beat the heat with food. Some summer foods are not native to us – they can practically be found around the world. However, some are particularly Filipino, while others we try to put a Filipino twist to. Here are some of the best heat-busters that would cool your body down during these hot summer days. • Local Sorbetes. The local sorbets is the Filipino version of ice cream. It is popularly called “dirty ice cream” but it’s not really dirty. The name might stem from the fact that it is sold in the streets by vendors. They are usually homemade too. The local ice cream is not made from cow’s milk. Instead, we use carabao milk or coconut milk. They are actually healthier because they are less sweet than the ice cream sold in the malls. Popular flavors include cheese, mango and ube (local Philippine yam). • Milkshake. Milkshakes can be found almost anywhere in the world. The difference of our milkshake is that we use local fruit. The national fruit, mango, is usually the most preferred by milkshake flavour. There is also a green mango milkshake, which I am pretty sure can be found only in the Philippines. Buko milkshakes are also in the trend nowadays. • Sago’t Gulaman. Sago’t Gulaman is popular all throughout the year, but it usually becomes sold-out during the summer season, especially around noon-time when workers take a lunch break and walk to canteens. It is made of tapioca pearls and colorful sliced jelly mixed with arnibal, a caramelized brown sugar sauce. It is then mixed with loads of ice and a bit of water. • Ice candy. 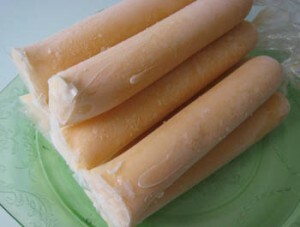 Ice candy is usually fruit juice or shake placed in small ice candy wrappers and frozen. It is especially popular to the kids because it is incredibly cheap. People usually make ice candies out of mangoes and condensed milk, but you can use other flavors like chocolate (Milo tastes great), strawberry, avocado, or you can just use powdered juice and water. 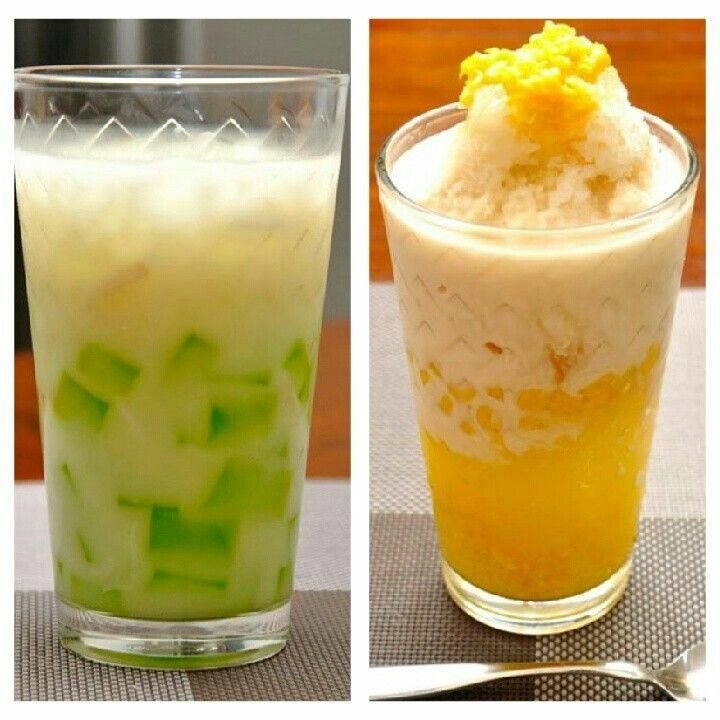 Buko Pandan and Mais con yelo..
• Mais con yelo. Mais con yelo is whole corn kernels mixed with evaporated milk and shaved ice. There is also a version where you use the local Saba bananas called saging con yelo. • Buko Pandan. Buko pandan is a refreshing Filipino food. Pandan is local shrub that produces a flavorful aroma. Buko pandan is prepared by mixing young coconut, small tapioca pearls, cream, condensed milk and pandan jelly. The pandan jelly may be bought or you can use unsweetened jelly and add a few drops of pandan essence. • Ice Scramble. Skrambol as it is popularly called is a Filipino food sold throughout the year, usually outside schools and churches. It is a cheap cold treat made of shaved ice, sugar, chocolate syrup, milk, food coloring and gelatin. People say this is a cheaper version of the milkshake. • Halo-halo. Halo-halo is the king of summer foods in the Philippines. Halo means mix, so halo-halo is a mix of sweet ingredients and ice. It usually contains sago (tapioca pearls), gulaman (jell-o), white kidney beans, red mung beans, macapuno (sweetened coconut), whole corn kernels, rice krispies, jackfruit, evaporated milk, sugar and shaved ice. It is topped with ube (Philippine yam) and Leche Flan (Spanish egg and milk flan with caramel sauce). Some people add a scoop ice cream. Many foreigners enjoy this Filipino food out of all the summer treats. Filipinos love to eat. Even with the extreme summer heat, we look to food (not air-conditioning) to help us cool down. If you are ever visiting the Philippines during the summer season, be sure to try out these popular summer treats. Summer Filipino food is not only refreshing. It is definitely delicious! This entry was posted in Uncategorized and tagged Filipino, Food, Halo-halo, ice cream, insurance, MAPFRE. MAPFRE Insular, Philippines, Pinoy, summer. Bookmark the permalink.